I think the thing that make Sleight work as well as it does it the gentle, nurturing approach that writer director J.D. Dillard brings to his film. Sleight is gorgeously shot, focusing on little details, finding beauty in common, everyday things. From the washed out greys of Bo's daily grind to the shadowy colours of his evening proclivities, Dillard finds a way to film it all so that you don't want to stop watching. Sleight is the kind of film which is a joy to watch. 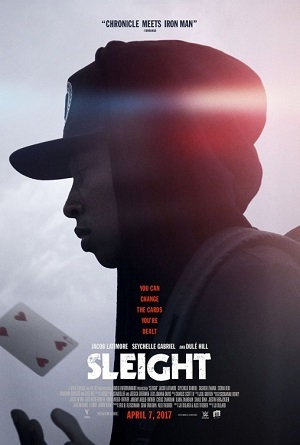 Every great film needs a great story and Sleight is no slough there either. While perhaps not that original, Sleight's narrative is engrossing from start to finish. Young, disenfranchised, barely an adult himself, has to make his way in the world while supporting his little sister after their parents died. Sure he encounters all teh typical challenges from not being able to afford to live in a better neighbourhood to getting involved with gangs and crime. The twist is he's a magician and how he uses his skills, and his smarts, to outrun the deck which is stacked against him. Bo is played by the magnetic (no pun intended) Jacob Latimore. He is another big part of the success of Sleight with his naturalistic and compelling performance. Will this be his breakout role? It certainly wouldn't surprise me. He has the movie star thing going. Also strong is Dule Hill in an against type role which surprised me as I haven't seen him do anything like this before. Sleight quietly builds through its gut wrenching plot and comes out the other side completely satisfying. This is one of those little films you need to make a point of seeing.